Del900 Hostel Boutique. Uncomplicated hostel/hotel with great location. They have double rooms with private bathrooms + ac/heating, and the building itself is an experience. You can book it here. Don‘t miss an Argentinean breakfast at famous Café Tortoni (cafe con leche con medialuna). Celebrities have been drinking their coffee inside this Parisian style café. El Establo. Great Argentinean grill restaurant (Parrilla) not far from the port and shopping street Florida. Chiquilin (Chiquin). Traditional classy bohemian restaurant around the corner of Buenos‘ Aires broadway Avenida Corrientes. Pippo. Simple grill restaurant just a few meters away from above mentioned Chiquilin. La Estancia. Another recommendable steakhouse that serves huge baked potatoes. El Museo de Jamón. Nice Spanish restaurant where you can enjoy ham, seafood and paella. El Imparcial. More hispanic gastronomy with a 150 year tradition. For a spectacular Tango show go to Homero Manzi. They also offer tickets without pre-defined food or drinks and you can order a la carte. Avenida Corrientes is known to be the city‘s Broadway. It is filled with theaters and restaurants. Just to name some places where you can enjoy a show: Teatro Apollo, Teatro Astral, Teatro Alvear. Two very different cinemas: The Gaumont is a cinema supported by the government and only displays Argentinean movies (with tickets for less than 10 pesos). Inside Recoleta Mall there is a modern cinema showing Argentinean films as well as popular international blockbusters. Teatro Colón. The exuberant decoration of the most famous theatre in Buenos Aires is breathtaking. It opened in 1908 with Verdi‘s opera Aida. Today they also offer guided tours through the luxurious salons. Palacio Barolo. An impressive building and incarnation of Dante‘s famous "Divine Comedy". The guided tours lead you up to the top lighthouse and you have a great view over the city. La Casa Rosada is the famous president‘s building with its "Evita balcony". Tours through the building are offered and there is a museum at its back. The Obelisco is set at the crossing of Avenida Julio 9 and Avenida Corrientes. In total there are 24 lanes running around it! Every Sunday there is a colorful flea market along the street Defensa leading down to San Telmo and its Plaza Dorrego, where you will probably see an open air tango show. The flea market is a great place for getting souvenirs like Filetes (typical colorful artistic drawings) or local artwork. El Zanjon. A beautifully restored building complex (and event space) that you can visit on a guided tour – leading you back to Buenos Aires‘ past. Mazana de las luces. The so-called "illuminated block" is one of the city´s landmarks and formerly was an important center of culture and education. They offer guided tours through the buildings and tunnels as well as theatre shows. The Palacio de las Aguas Corrientes is a grand building with highly elaborate facades hosting a humble function: the city‘s water supply. MALBA. The world-known museum for Latin American modern art. They also have a cute museum shop. The Recoleta cemetery is very impressive and important personalities are resting there, e.g. Eva Perón. To travel to Asia you only need to visit the Japanese Garden where you can take a walk and eat some traditional food. Palermo is a beautiful neighborhood to take a walk through. The colored buildings are filled with little shops and restaurants. For upper-class shopping visit Galerías Pacifico and admire this national historic monument. The bookstore El Ateneo Grand Splendid at Avenida Santa Fe is set inside an old theatre – a great browsing experience. Buenos Aires' people call themselves Porteños to emphasize their connection to the port. 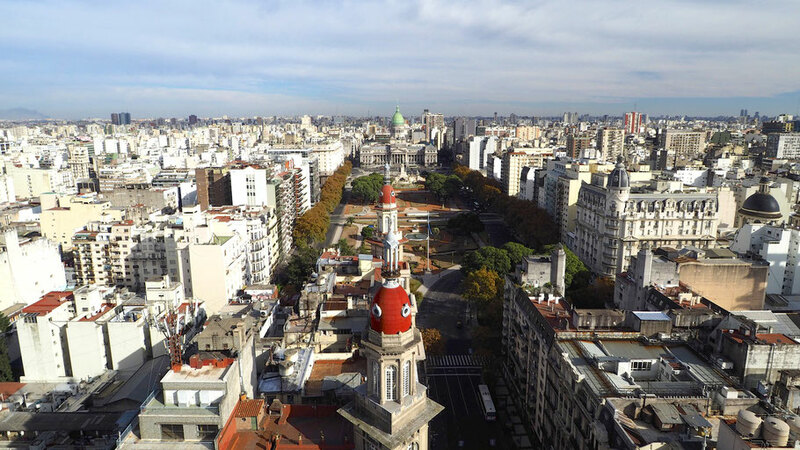 Visit the neighborhood of Puerto Madero to get a glimpse of the modern harbor. Interested in how we planned the route for a less than a month trip from Lima to Buenos Aires?